Great view of the Acitrezza bay from the apartment + 100sqm terrace, relax and solarium. 150 meters from the beach and 200 meters from Acitrezza downtown, where many bars, restaurants and touristy harbour are located. >> The apartment has been renovated in December 2018 (wall painting internal and external, terrace, fence and stairs, and several furnishing to make it more clean and comfortable). Big TV and dining room with 3 sofa bed, living room with another sofa bed, 2 double bed room, kitchen, toilet and laundry room. Satellite TV, refrigerator, washing machine, air conditioning. Acitrezza is the most famous touristy location in the Catania province. Possibility to access the famous private beach lido dei ciclopi (not included in the price). Catania is only 7km away. Taormina is 30 min driving distance. The appartment is well located, but did not fullfil any of our other expectations, sorry to say, but we are very disappointed. The appartment would need a complete and carefull renovation and against the description of the facilities we did not have a second bathroom/shower. The pictures at HomeAway web-site are showing a nice place, but in truth the doors, windows and shower as well as the walls need an urgent renovation. Several lamps did not work and the plug sockets were not available on places you would expect some. Sorry - but we can not recommend this place and the owner had been informed about our rating directly. The apartment is in the Aci Trezza town. I faraglioni and the Norman castle are at walking distance. 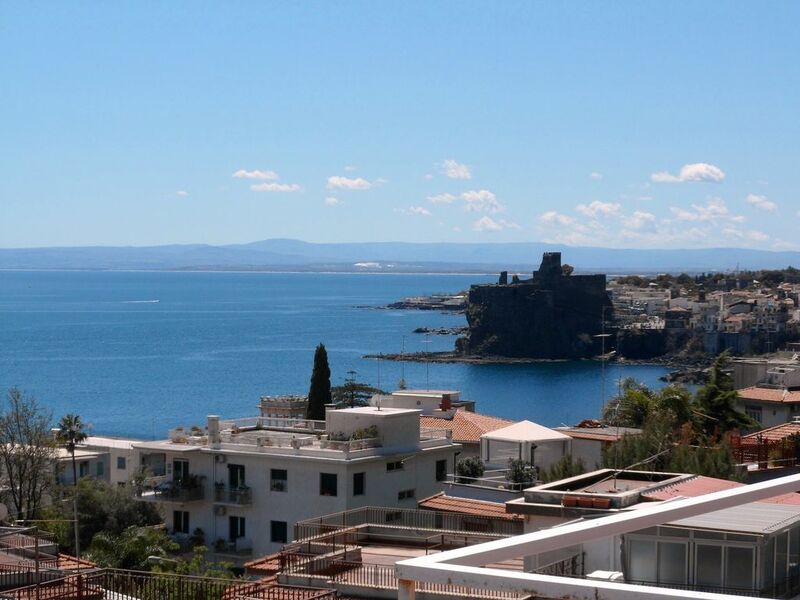 Lido dei ciclopi is just in front and from the apartment you have spectacular view of the Catania bay. Etna volcano is 30 min driving. Also Taormina can be reached in 30 min. Siracuse is 45 min. This is an excellent location fr a summer holiday.